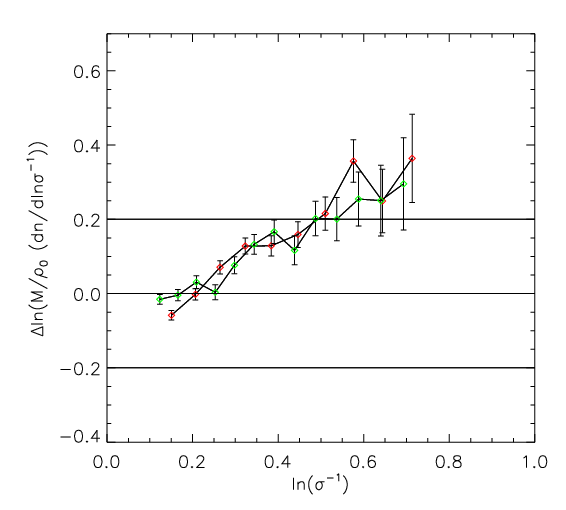 Comparison of the mass function : 512^3 platine (red) vs run 512^3 Babel (green). 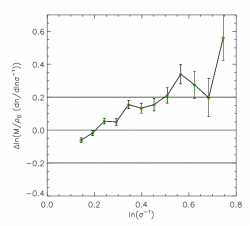 The model in use is the Ratra-Peebles quinessence cosmologie : RPcdm. The Boxe size is 648h-1.Mpc. 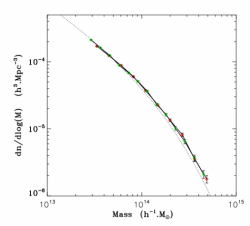 The mass functions from CCRT Platine and IDRIS Babel completely aggree up to the error bars due to two different initial conditions realizations. 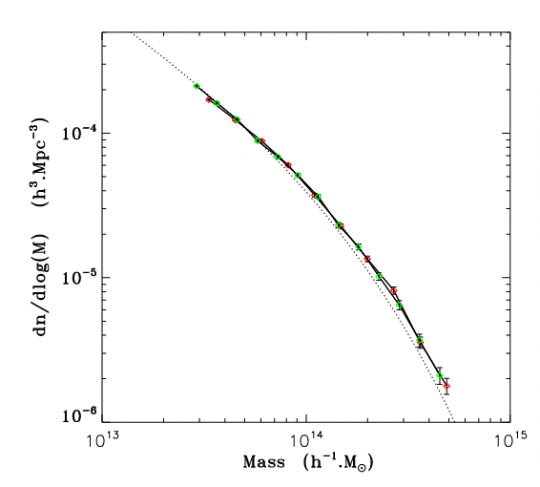 The doted line represents the Jenkins prediction for the mass function. The agreement with the Jenkins or Sheth&Tormen fits is well established for low mass haloes. We find an agreement for medium range halo masses i.e until 7.10^13 solar mass but a deviation to the Jenkins fit for high mass haloes. The difference between the Babel and Platine run are caused by the seeds which are different, the ramses versions which are different, and the redshifts which are close to 0 but slightly different!. The two simulations seems therefore compatible. The differences with the Jenkins fit have already been investigated before. 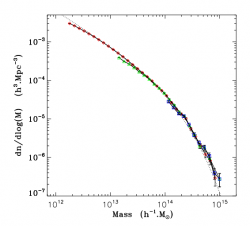 First of all, they are very small and they are just amplified by the steep slope of the mass function at the very high mass tail. We found four potential reasons for these differences: hanning filter in the initial conditions of Jenkins and Warren (? 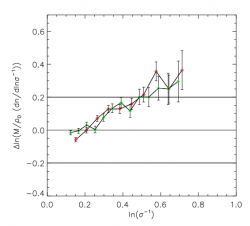 ), the redshift of intial conditions is too recent (? 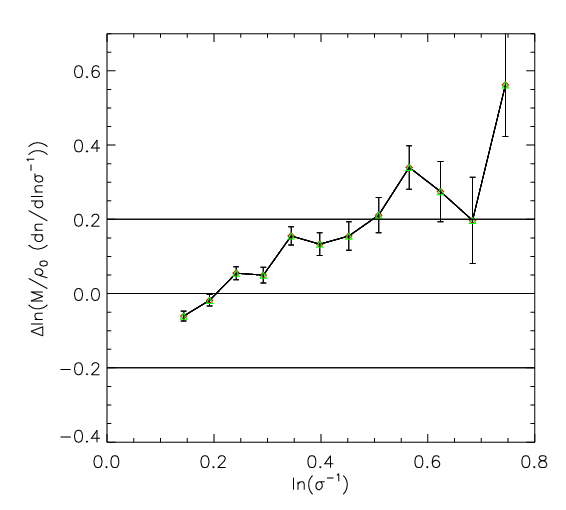 ), bin size effects which were overcorected in jenkins et al 2001(? 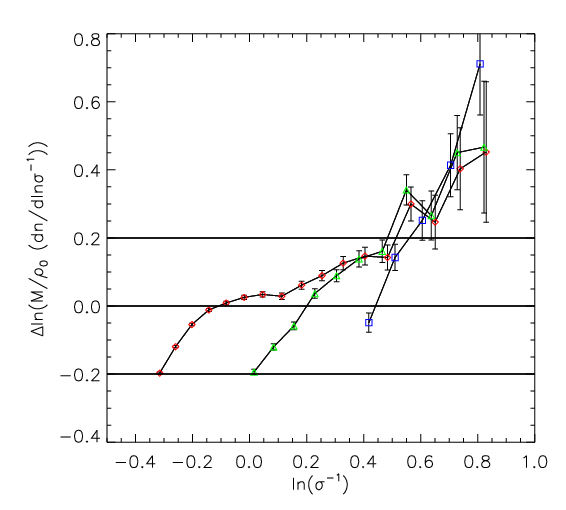 ), N-body solver of Jenkins and Warren which gives lower mass function than the other N-body code (see the Cosmic code comparison project). The simulation is still RPcdm 512^3 on 648h-1Mpc. The two versions give identical results. This validates the paralelization version (F.Roy).This result is also confirmed by many tests for different numbers of procs for the paralelized version. The deviation to the Jenkins fit is confirmed by the numerical convergence.